With over 80,000 unique items capable of being branded with an imprinted promotional advertising gifts message, we have both the experience and resources to enable you to get the items you need at the right price. From coffee mugs, can coolies, pens and key fobs all the way to high-end customer appreciation or employee recognition gifts, we can assist with whatever your needs may be. 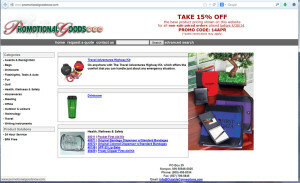 Check out our dedicated site: www.PromotionalGoodsNow.com for additional details and exciting product ideas. Check the website for current promotions and sale pricing.